"March is going to be Mike Portnoy Month," says the drummer whose name just so happens to be Mike Portnoy. "I've got Adrenaline Mob coming out on the 13th, and Flying Colors comes out two weeks later. It's either a brilliant move to release both albums so close together or it's completely insane - I'll find out soon." 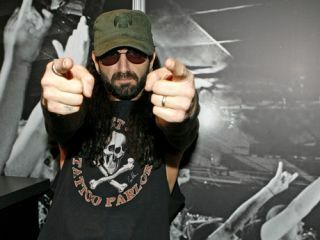 With a rabid fan base developed during his years in Dream Theater, along with highly regarded side projects like Transatlantic, Liquid Tension Experiment and a host of big-time pedigree cover bands, Portnoy's involvement with any project is bound to stir interest. Even so, Portnoy admits that the level of expectation leading to the release of both Adrenaline Mob and Flying Colors feels different than what he's experienced in the past. "People have been waiting to hear what I do after leaving Dream Theater. All of 2011, it was like, 'What's Mike going to do? What's Mike going to do?' I understand that. And now, I'm giving everybody the answers." In two wildly disparate and altogether winning ways. Recorded in the early part of last year, the eponymous debut album from Flying Colors, a quasi-supergroup comprised of Steve Morse (guitar), Neal Morse ([no relation] keyboards, vocals), Dave LaRue (bass), Casey McPherson (lead vocals) and Portnoy, combines pop, rock, prog and hints of metal with captivating narratives. "These are two albums I'm very, very proud of," says Portnoy. "Stylistically, they're worlds apart, but then I've always done that of thing. I need to mix it up. Being creative with different people, surprising yourself - that's what it's all about. I'm having a blast." MusicRadar sat down with Portnoy at the NAMM show in Anaheim, California to talk about his new Tama Melody Master signature snare drums. Afterwards, we discussed how he views Adrenaline Mob and Flying Colors, what working with Steve Morse was like and how different guitar players shape his drumming. Was their ever any thought to spacing the release of these two records further apart? [laughs] "The truth is, both record labels were originally shooting for the same date. I had to sort of convince them not to. They were like, 'No, it'll be great promotion, Mike.' And I said, 'When was the last time you heard of a major artist putting out two different records on the same day? There's a reason not to!' You don't see Brad Pitt putting out two movies on the same day. Eventually, we worked it all out." Flying Colors are (from left) Neal Morse, Steve Morse, Mike Portnoy, Dave LaRue and Casey McPherson. Would you call Adrenaline Mob more of a "band" band than Flying Colors? Do you see Flying Colors playing shows? "I would hope so. We'd absolutely love to. Our biggest problem, really, is scheduling. Everybody in Flying Colors is in other bands that are very busy, most notably Steve with Deep Purple. We're pretty much at the mercy of Deep Purple's schedule. Our fingers are crossed that we can work something out." But how are you going to play in the two bands at the same time? Adrenaline Mob seems like a group that's made for touring. "Without a doubt. Adrenaline Mob is absolutely a touring band. The few weeks of shows we did last year proved that. It became very obvious to all of us that we are a live band, and that's where the true strengths of that band lies. I hope to keep totally busy with Adrenaline Mob this year. Flying Colors and other things, I'll fit those in where I can." "What happened with Paul DeLio and Rich Ward, they're in Fozzy, and Fozzy is going to be very busy this year, as well. That's the problem when you work with people who are in multiple bands - the schedules get crazy. When it became apparent that Adrenaline Mob was going to be a heavy touring band, it was decided mutually that we shouldn't hold anybody back. "Paul and Rich did the tour last year, and they were great. After that, we all felt that we should get a couple of guys in the band who have no other commitments, who can be in Adrenaline Mob full-time." Do you have anybody in mind for the band - or picked out, for that matter? "We do, but it's nothing I can mention right now. I want them to be real band members. It's hard enough with my schedule and Russell with Symphony X to plan everything out. So yeah, having two other guys who can commit 100 percent, that will make a big difference." You're probably more "hands-on" with Adrenaline Mob than with Flying Colors, right? "With Flying Colors, you have five band members, four of whom have very strong artistic personalities. On top of that, we had Peter Collins producing, and an executive producer who put the whole thing together. So that's seven chefs in the kitchen, which is a lot. Still, there was room for everybody to put their ideas out there and be involved. "Adrenaline Mob is basically myself, Mike Orlando and Russ, and although they had the music before I came on board, they were extremely welcoming, and they almost encouraged me to exert a very strong leadership role in the band. I'm not leading the band, but the guys definitely want my guidance and experience." In making both of these records in a short period of time, what did you learn about yourself? "Well, there's the musical side and the personal side. Musically, both of these albums were about restraint. For all of years I was with Dream Theater, and in doing Transatlantic and Liquid Tension Experiment, it was about over-the-top playing. Not to say that we didn't play for the songs, but the songs usually called for that kind of over-the-top playing. "The songs that we do in Adrenaline Mob and Flying Colors don't call for that. Every once in a while, we'll pull out some shredding and some big kind of playing, but for the most part, these are song-oriented projects - one being a hard rock/metal kind of project, and the other being more pop and alternative-based. For me, it was all about restraint and playing what was appropriate for the songs. "What I learned personally from both bands was how to embrace the collaborative spirit. After all of those years running the show in Dream Theater, I'm not looking to get into another band and call all the shots. I'm enjoying not being the leader; I'm enjoying being a team player. Both of these bands were cases in which they asked me to come on board. I was coming in and playing a certain role." Three's a mob. (from left) Portnoy with singer Russell Allen and guitarist Mike Orlando. What was working with Steve Morse like? "It was a dream come true. Steve has always been one of my favorite guitar players. Ever since I first heard him in the Dregs, in their early '80s beginnings, I thought he was incredible. I followed him throughout Kansas, the Steve Morse Band and into Deep Purple, and then I got to know him personally - the Dregs toured with Dream Theater. I've always wanted to work with him, and I gotta tell you, it was a real pleasure when it actually happened." Mike Orlando - a very different kind of guitarist. What was playing with him like? "Like you said, quite different from Steve Morse. At this stage in his career, Mike is a complete unknown, but I think that's all about to change. He's been waiting for his big break, so he's hungry and excited about the whole experience. "He's a tremendous talent, a brilliant shredder in the vein of Zakk Wylde or Dimebag. He comes from that school of riffs. I really enjoy working with him. You know, I'm probably spoiled a little: I've been blessed to have worked with so many unbelievable guitarists over the years." Do certain guitar players change the way you play? Can you feel yourself adjusting your style to a particular player's idiosyncrasies? "Oh yeah! Absolutely. The way I lock in and play with Steve is very, very different from the way I lock in with Mike. Mike is a very heavy player, whereas Steve isn't a very heavy - he's more about chords and textures. So the way I approach the drums and interweave my parts with the guitar parts changes from player to player. "Everybody you play with has an effect on you. And if you're lucky enough to play with amazingly talented musicians, it makes you a better player. Then you might do something that sparks something in what the other guy does, and it keeps going. I love that. I still love it! It's what keeps you going. It's something that never, ever gets old."